Life Science Innovation Network Japan, Inc.
Mitsui Fudosan Co., Ltd. (headquartered in Chuo-ku, Tokyo; President and CEO: Masanobu Komoda; hereinafter “Mitsui Fudosan”) announced today that it has been entrusted with operations related to the management and administration of facilities and venture support at new incubation facilities which the University of Tokyo (located in Hongo, Bunkyo-ku, Tokyo; President: Makoto Gonokami; hereinafter “the University of Tokyo”) will establish in the south research building on Hongo Campus and concluded an agreement for same on Monday, October 1, 2018. 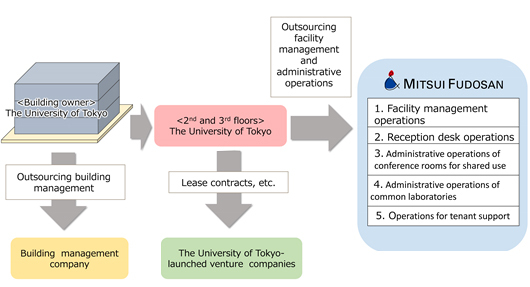 On behalf of the University of Tokyo, Mitsui Fudosan will undertake (1) facility management, (2) reception desk operations, (3) administrative operations of conference rooms for shared use, (4) administrative operations of common laboratories and (5) operations for tenant support. Mitsui Fudosan will support the University of Tokyo-launched venture companies and entrepreneurs by creating a place and constructing community as a unit, leveraging the know-how it has cultivated in its initiatives for new business creation through urban development such as a life science innovation promotion project, Kashiwa-no-ha Smart City and a venture co-creation project. Subcontracted by Mitsui Fudosan, Life Science Innovation Network Japan, Inc. (headquartered in Nihonbashi-Honcho, Chuo-ku, Tokyo; Chairman of the Board: Hideyuki Okano; hereinafter “LINK-J”) will also conduct operations for some of the (5) operations for tenant support. LINK-J will seek to create an eco-system to encourage the creation of innovation and new industries by facilitating exchanges among tenant companies and with investors and other supporters, as well as supporting events for tenant companies, leveraging the knowledge it has in building a platform for human interaction and information exchange, developed in the life sciences domain in Nihonbashi. This is the first time Mitsui Fudosan and LINK-J will undertake the management and administration of innovation facilities for a university. It is also the first time that LINK-J will support community formation for venture companies in domains beyond that of life sciences. LINK-J and Mitsui Fudosan will continue to support the building of an eco-system where innovation and new industries will continue to emerge autonomously, and will contribute to the development of Japanese industry centering on the life sciences by promoting industry-academia collaboration. In doing so, they aim to contribute globally to addressing issues for the next generation. Positioning the return of its research outcomes to society by commercializing them as a key mission, the University of Tokyo has established incubation facilities as part of its initiatives for improving the incubation environment. These are facilities for those aiming to commercialize patents and other intellectual property they hold in the form of starting a business, as well as for start-ups launched by undergraduate/graduate students and research scholars who have received innovation education at the University of Tokyo. The Division of University Corporate Relations of the University of Tokyo, which operates the facilities, is an organization established for the purpose of providing common platforms for industry-academia collaboration and actively supporting related activities inside and outside the university as an organization under the direct control of the president. LINK-J is a general incorporated association established by Mitsui Fudosan and volunteers from academic circles. With its base in the Nihonbashi area, where a number of pharmaceutical companies are clustered, LINK-J aims to promote open innovation in the life science realm through industry-government-academia cooperation and extend support to the creation of new industries. Across the entire life science area, i.e. the area where all sciences are combined, ranging from medicine to science and further to engineering or new technologies, such as information and communication technology (ICT) or artificial intelligence (AI), it will accelerate interdisciplinary human and technological exchanges.